Y-AIR, Finland Japan AIR 交換プログラム2017 進行中!! 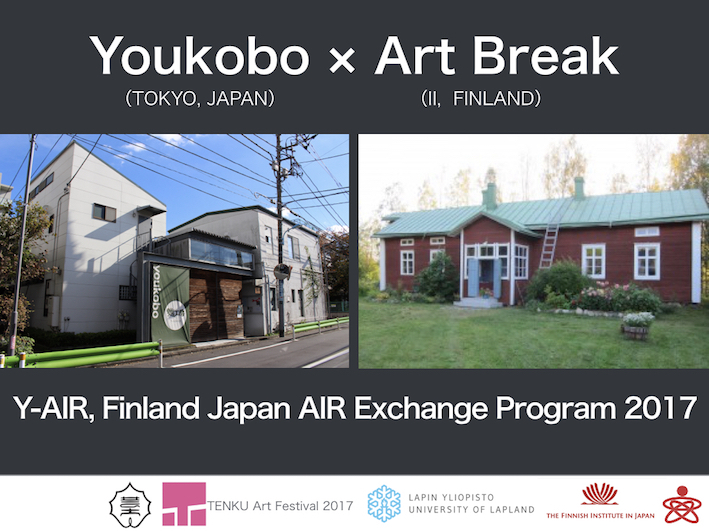 The proposed project is principally coordinated by Youkobo Art Space located in Tokyo, Japan in partnership with Art Break, located in Ii, Finland from 2017. Art University and AIR cooperation based exchange program between Japan and Finland will start from 2017. The program will focus on exchanging young and emerging artist/researchers, and common theme and approach is to be environmental art, local culture, craft and design using materials from the nature. First year and piloting case will be conducted in 2017, when Japanese young researcher/artist travels to North of Finland in the beginning August for 6 weeks.